So I think only my fellow knitters understand the joy and the pain of friends having babies. Because babies are cute and we want to knit them all the stuff and yet there’s so little time and so many babies that our collective fingers will all fall off at some point. You get me, right? I came up with this knitting pattern for a friend’s baby and I’ve made it for several since then. I double-knit it to cut down on some of the time it takes to finish (and because we live in Colorado and it’s dang cold). I used Bernat Baby Yarn. The pattern is simple but has a little style to it, I think. 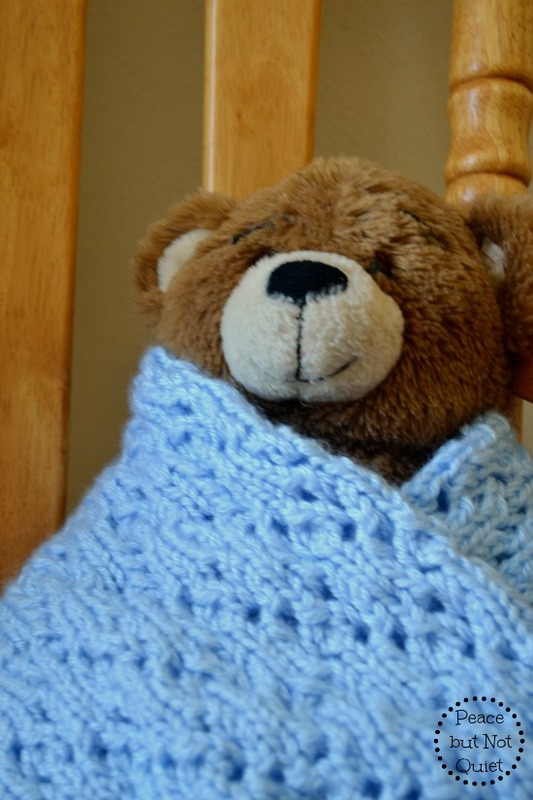 Gauge — ummm…is it wrong to confess I never pay attention to gauge in blankets? They don’t need to fit and as long as they look good, I kind of let it go. Holding two strands of yarn together, cast on 101 stitches. 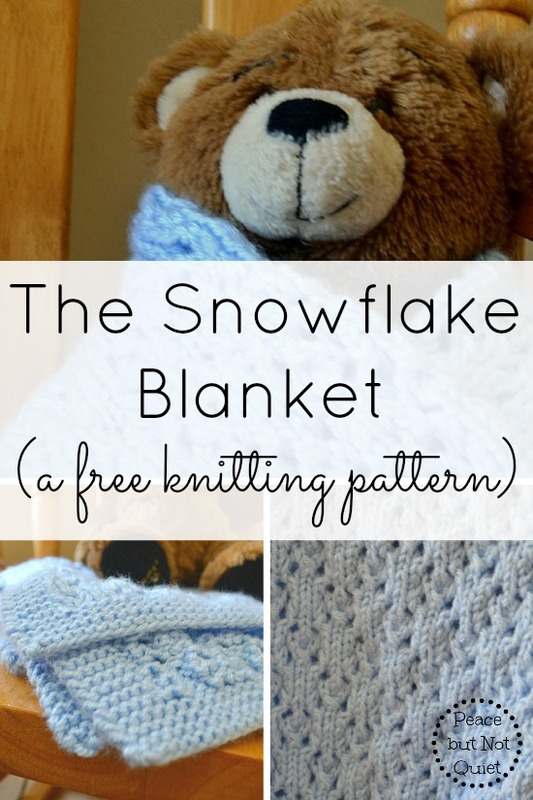 repeat Rows 8-19 until blanket measures approximately 40″ from cast-on edge. Knit final 7 rows, bind off all sts in knit. Weave in loose ends. Hi. I was really excited to find your patter . This blanket is really beautiful! I am somewhat new to knitting. I am wondering if I can use your pattern and single knit with a yarn of weight 4 instead of 3. Would the look be similar? I am knitting a blanket for the first time. 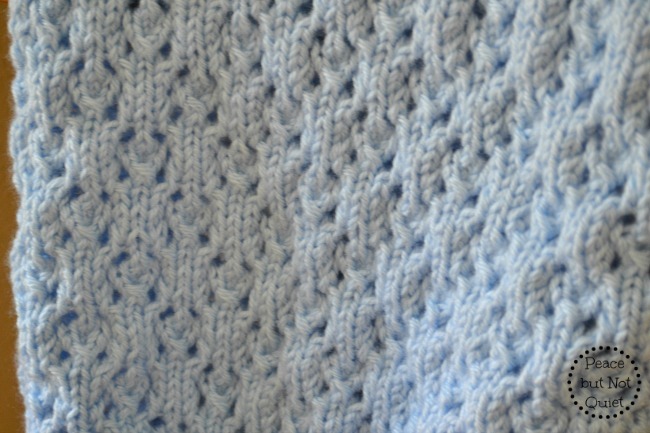 What difference will it make to double knit or single knit for this pattern? Thanks for any advice!! I live in UK, how does your size needles etc translate? If you google the knitting needle sizes it will give you the mm and us sizes. Or if you have one of the needle sizers it will be on there to or it should be. Howdy! How can I make this to be a throw size? I’m not good with math so please help. Thanks. What is approximate finished size as stated? I’d like to make it stroller or car seat size, any advise for number to cast on? Love the pattern! Thanks for the free pattern! Do you happen to know the stitch count of the repeat? Meaning if I want to make a smaller or bigger size, how many stitches to CO.
hi! The repeat is multiples of 6 sts + 1…so any multiple of 6 + 1 + whatever you’d like for a border! Have fun! Hi. I would like to use a heavier yarn. What would you suggest? Hi. I would rather use a heavier yarn. What do you think would work for this pattern? Thanks for the pattern! Very pretty. Hey, does double knitting really make blankets knit faster? I had no idea! I think so…you use more yarn while doing fewer stitches so it feels like it goes faster to me! Question, is this 5 skeins totalling 1000 yds or 5 skeins of 1000 yards? Thanks! 5 skeins totaling 1000 yards. Each skein should be around 200 yds, or 50 grams. Happy knitting! Precious and looks super soft! Pinned.